Kevin O’Brien Chang, columnist for both the Gleaner and the Jamaica Observer, has recently published his second book, “Jamaica Fi Real” and will be discussing it on Friday, February 18 at Bookophilia at 6pm. “Jamaica Fi Real” showcases the many positive aspects of Jamaica and according to The Sunday Gleaner, September 26, “The book provides an in depth look at Jamaica’s people, history, music, sports, religion and culture, creating a vivid 21st-century portrait of perhaps the world’s most fascinating island”. 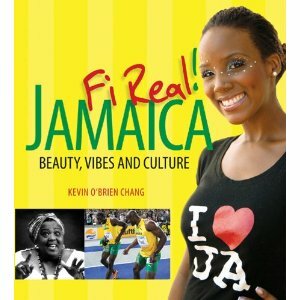 “Jamaica Fi Real” is the result of Kevin O’Brien Chang’s desire to clear up some of the misconceptions about Jamaica. Not only does this book highlight the best of the island, but it also underscores significant achievements in the country’s history and little known facts about Jamaica. Complete with over 200 illustrations, the book contains a wealth of information. Where else could anyone get that type of info in such an ideal method of writing? That sounds interesting. I like that he’s addressing misconceptions and replacing them with facts.